The award-winning 137 Pillars House is a stunning 30 suite boutique Hotel with a rich colonial past; built around the original colonial teak homestead which dates back to the late 1800’s. It is located in a leafy residential enclave a few minutes’ walk from the historical Watt Gate Temple, Ping River and boutique shopping area. The hotel is a member of the prestigious Small Luxury Hotels of the World (SLH). 137 Pillars House is THE perfect destination for romance, whether for your first visit, Valentines, a romantic getaway or your annual anniversary tradition. Once you have experienced this special property you are sure to want to return again and again. 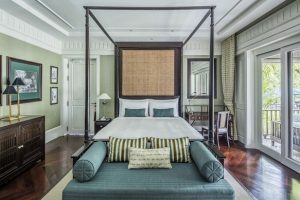 Elegantly designed luxurious suites take you back to the romantic colonial era. Black and white tiled verandas, cane shades, rattan furniture and free standing Victorian baths are reminders of days gone by, and blend with modern facilities including romantic outdoor gardens showers, flat screen televisions and the all -important wi-fi access. An exquisite range of suite options are available from the popular Rajah Brooke Suite or the newly created David Fleming Macfie Suite, up to the Louis Leonowens Pool Suite. .
Additional nights are available at best available rate for applicable dates. All rates are nett, inclusive of applicable service charge and government taxes.